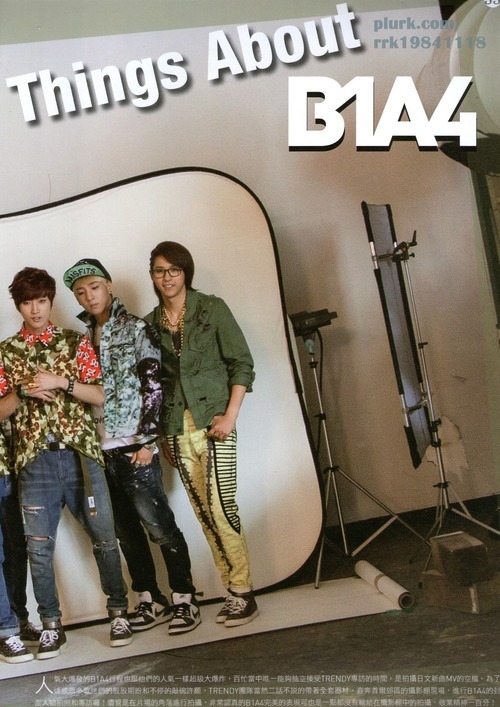 Do you still feel a little unsatisfied after reading the interview with B1A4 in issue no. 38 (August edition) of TRENDY magazine? This time, we’ll show you the behind the scene shots of B1A4’s photo shoot! B1A4 has a schedule that is as explosive as their popularity, and the only time in which they were able to take time out of their busy schedule was in between their filming for their new Japanese MV. In order to fulfil the B1A4 fans’ requests, TRENDY brought all the necessary equipment flew to Seoul to the studio without a second word so as to be able to directly interview B1A4 and hold a photo shoot! Even though we’re taking photos on a corner of the set, B1A4’s wonderful expressions definitely matched up to what they could’ve had while shooting on a set, and their professionalism is 100%! 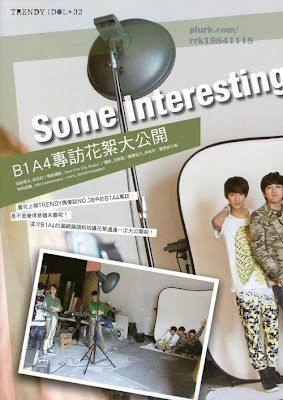 The good feelings between the B1A4 members are fully exposed, right from the members’ actions from when the photo taking begins, where they speak softly to one another with smiles, or pat one another’s backs or shoulders, to the point where even when it is not their turn to be in the photo, they continue watching one another’s photo shoot from the side, looking attentively. After taking a group shot, the B1A4 members gather together in a small circle to play scissors paper stone. It turns out that they are using it to decide who gets to have their photos taken first, and after the game, looking from their expressions, you can tell who has to have their photo taken last! Mischievous Sandeul takes the opportunity to sneakily tug at Jinyoung’s collar when they’re getting their clothing fixed, and Jinyoung, who got a huge shock, immediately grabs his face as a form of punishment, only to find that Sandeul doesn’t back down, returning a blow. 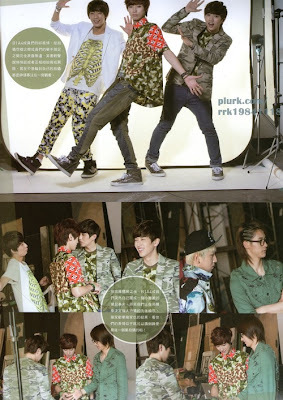 The mischief Sandeul is wrecking doesn’t end, and he makes a move on Gongchan when they’re starting their photo shoot, and when Jinyoung isn’t noticing, they quickly exchange poses with tacit understanding, and Jinyoung, who’s unable to react on time, bursts out laughing, along with everyone else present.